With The Diva's challenge #85 this week we are playing with Margaret's copada. I always enjoy visiting Margaret's blog, she has fantastic ideas and many new tangles to try. 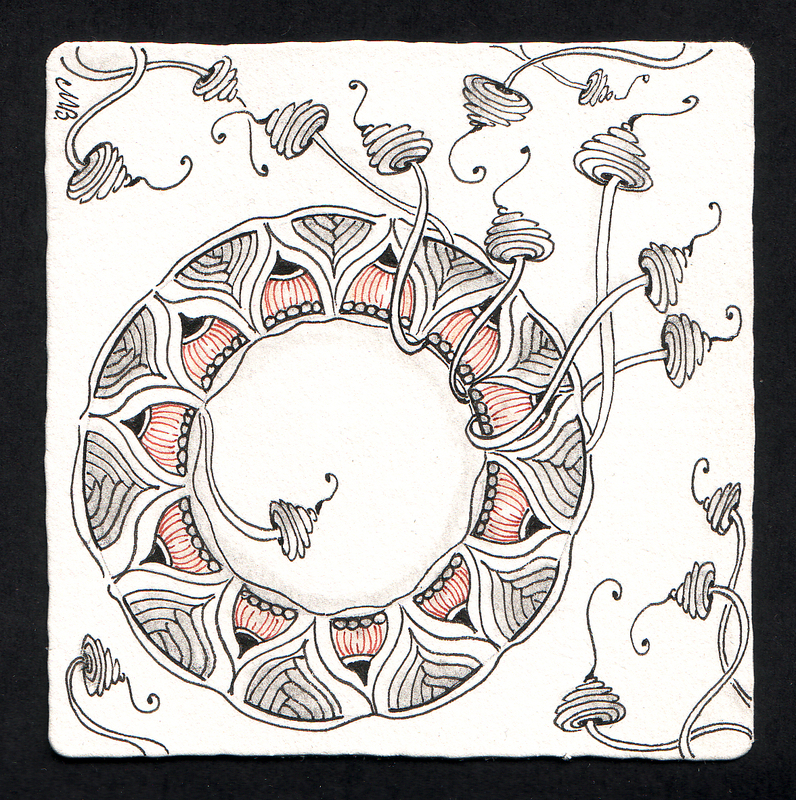 Tangling this tile I spun copada into a circle for a bit of fun! Thank you Margaret and Laura. Great idea to use Copada in a circle, and as always so beautiful! I love it! The circle is brilliant--such a fun tile! Very beautiful, the litle touch of color and the cones. Makes a very flowing and natural look. You are an artistic genius. So light and airy it seems to be floating. Beautiful. Very delicate and lovely. What are those cute little spiral cone thingies. I keep seeing them in others art, and I love them. Linda, I have seen them in Maria's zentangles quite a bit but I am not sure if they have a name or if they are a tangleation of sedgling. I agree they are cute! Copada perfection at its best! I love this one! I'm going through everyone's tangles and I must say, this one is really good. Very lovely and airy, like parts of the wreath are floating off into the sky! Lovely! The circle and the cones have such life. I love your use of white space. Copada in the round-love it! As always, it's s nice to go to your blog, because you have always made something so beautiful. And also this time. I love what you did. Beautiful, love your Copoda in the round and Lampions are the perfect accompaniment! Gorgeous, again! Love how you have used copada in a circle - such a cool idea :) The fill is very clever - when I concentrate on one pattern the other fades back & vice versa. Sounds like you have been having some windy weather, also! We have had such strong winds over the past two days it has been pushing the heavy wooden furniture across my verandah. This gives a wreath kind of an effect...awesome job! Love it. 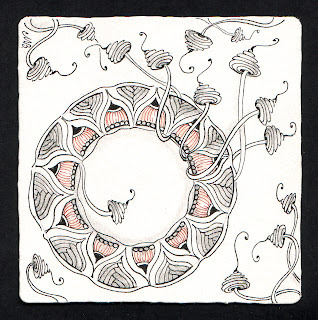 A whimsical tile. The touch of color adds so much. Another beauty, I love it. Great work, very graceful Shelly. Beautiful, beautiful! This is one of those tangles where the more I look at it, the more I can't figure out how you did it, and which order you did it in. I've never tried those little beehive guys - they look like a lot of fun, so I'll have to try them. Well, you never cease to amaze me! This is just awesome, and I absolutely LOVE the way you've interwoven and embellished with those cute cone type thingies. Always just the right touch of color too. Very beautiful!